And here we go. Creaky wheels moving now. I started my new job about three months ago and it’s been quite a steep learning curve. I used to work downtown, merely a 25min bus ride away and then a brisk 10min walk to the office. I had great lunch options merely footsteps away – food trucks, sushi restaurants, hotel fine dining…even Costco fries were a subway stop away! But in my new job, all that surrounds me is well…nothing. It’s an hour long transit ride into the suburbs and the nearby places are either the ethnic mom ‘n pop sandwich shops or fast food chains. And since I don’t drive to work, I’m stuck to options in the immediate block. As a result, I bring a lot of food with me to work. Any possible craving must be attended to so as a result, I have my main lunch, salty snacks, sweet snacks, fruit and yogurt. My vinyl Sephora tote is brimming with nutritional goodness! But then there are times when I want a cookie. A big, moist, dense cookie the size of my palm. Or a slice of cake. Which is where this recipe comes in. 2) Buttermilk is easy to culture on your own. I believe it’s 1 tablespoon of vinegar or lemon juice (1 tablespoon down, many many many to go) to 1 cup of milk. Mix gently and let sit for about 15 minutes to…err…culture. 3) You can use a Bundt pan for decorative uses but you can easily use a tube pan (Angel Food cake), loaf pans or regular cake pans. Just make sure you do allow for some room to rise and check in on the cake during baking (35 min – 45min) for doneness. 4) I added a generous splash of amaretto for added dimension. And because I love adding booze to all my baked goods. 5) So it wouldn’t be too messy to transport (and to reduce sweetness) I opted not to use the glaze. I think strawberry would also be an excellent option and foil to the lemon. 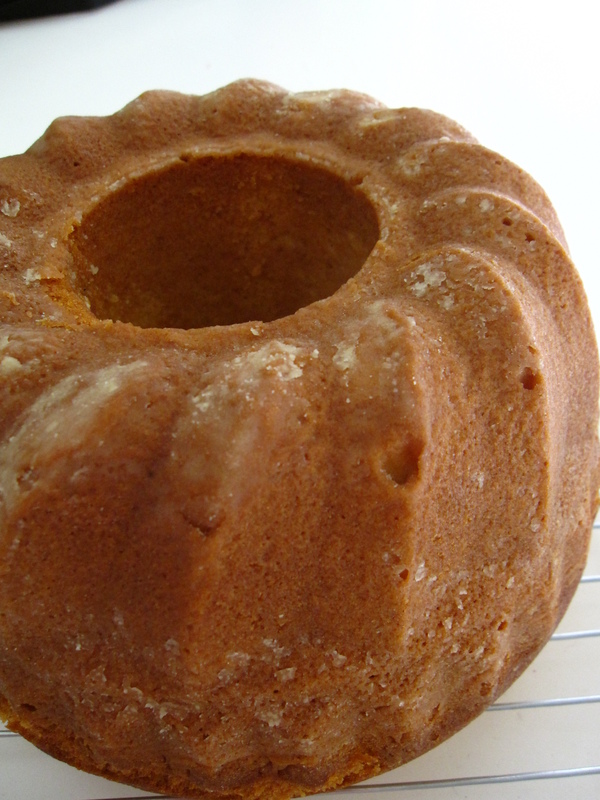 6) If you’re going to use a decorative Bundt pan – butter and flour THOROUGHLY. I used a baking spray to coat the pan and then added a handful of flour to the pan. I rotated the pan while tapping and tipping to ensure that all the little nooks and crannies had a nice coating of flour on them. The flour prevents the batter from sticking to the pan and ensuring a clean release. There really is nothing as satisfying than a well turned out Bundt cake. I was a little over-zealous with the flour as you can tell by the residue. Give the floured pan a good final tap over the sink to get rid of excess flour or touch up your cake with a good brushing with a pastry brush.